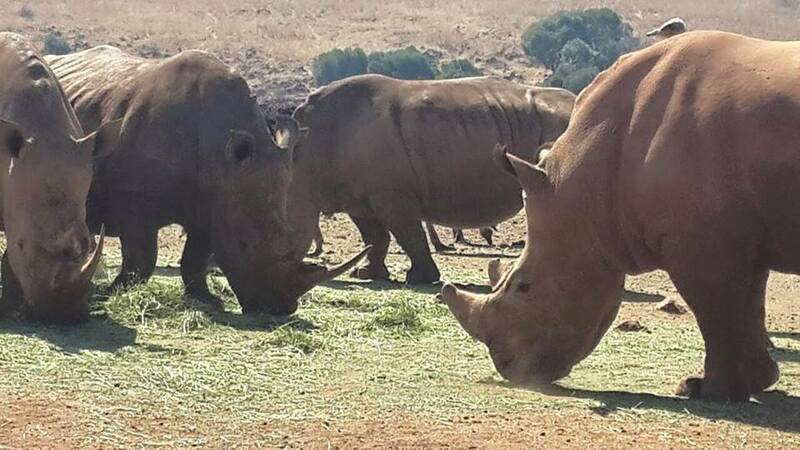 African Rhinos, communication and group behavior. Language. All creatures have it. I have just returned from Africa where I had the chance to observe many animals in the wild. It is clear that they communicate and they communicate clearly. If only we humans could learn a thing or two from them. In each group there is a hierarchy where each individual knows his and her place. No one is demanding equal rights, that is not the way of nature. Equal does not work the way we want it to. If you are not suited to lead, then you must not lead. You do not deserve your "share" of leadership. If you do not have medical knowledge then you do not have the right to be head of a hospital. This is the way of nature. So the animals communicate. Where there is danger, when there is a need to move on to greener pastures, when it is mating season, they communicate and they understand each other. There is order in their lives. We too need to communicate in order to preserve order, in order to avoid and resolve conflict. There was an issue between two of our instructors recently. They got together over lunch and the entire issue was resolved. That is how two mature men resolve an issue. They do not need a physical or legal fight. We need to set rules and use language clearly. I learned the difficult way. For several years I taught IKI Krav Maga seminars at universities, colleges and high schools in the USA and Canada. At times problems would arise as a result of a lack of clear communication. The answer would come in various forms, "We are so excited about hosting you at University of....."
"We can't wait for our students to meet you". "We look forward to a great experience". But at times, just as I was double and triple checking and confirming, (Yes, that is the way I am). I would be told..."Sadly we are not able to host you this year." or various other phrases along those lines. But I thought we were confirmed?!? "Yes, Moshe, We are confirmed! We will be hosting your Krav Maga seminar on this date. The event is guaranteed and you will be paid. This is our final confirmation." Now we are booked. I learned that wishy washy language counts for nothing. I demand clear answers or there is no deal. This has made my life much better and reduced stress. Clear simple language has improved my quality of life. Part of good communication and good business is establishing rules. Who pays for the seminar? When must I book the flight? Where will I stay? All this must be clearly outlined. In fact you will notice that on the IKI website all rules regarding membership and seminars are very clearly explained in detail. You only need to read it. There is a Jewish law that dates back to the Torah, the Bible. One that I have never been crazy about because sometimes I too feel the need to take the law into my own hands, but have learned to see the wisdom in it. A person cannot judge a financial matter for himself. This means you cannot decide that someone owes you money and therefore you are justified in taking money from him without his consent. I.e. You feel a store sold you damaged merchandise, you feel entitled to a replacement so you go and steal the item. This is not allowed. You feel you are being underpaid at work, so you decide to make less effort. Unacceptable. You must present your case to the proper authorities and then they can decide if you in fact deserve compensation. You cannot be the judge of your own case. You cannot say I feel entitled to take a little more. Sadly, you must work within the system and respect the rules of the place. I say "Sadly" because I too feel frustrated sometimes and feel like I am entitled to go to your bank account and take what I deserve. When we host our Tour and Train program we too must follow the rules. I have brought many groups to Masada and yet I still must pay for myself each and every time. I personally feel that by now I should be allowed in for free, but the rules are made by the host. Their rules are that if I bring thirty participants I can enter without paying. In our recent Tour and Train we had 21, I had to pay. The guest does not make the rules. I cannot attend and then decide I am not paying. Allow me to share a personal story, one that you can confirm for yourself and one that you can learn from. I know I have. Yad Va Shem Holocaust Memorial is a very visited place. As such it is wise to control the number of people who visit each day. Therefore if you are a group leader you must book in advance and receive approval to visit on any particular day. Fair enough. Makes sense, you can't have 5 busloads of tourists and school children and soldiers all enter at the same time, you will not be able to move. To enhance the experience for everyone the group visits must be coordinated in advance. Individuals, or families, can enter at any time. I came one year with a small Tour and Train group. There were only seven of us. This hardly constituted a group by my definition. In fact our Bible defines a group as ten adults. So be it. I arrive with my group and the "group manager" Shuki, spots me and stops me on the spot. He declares that we are a group and demands to see my reservation. I did not make a reservation. I argue with him. I am terribly worried that my overseas guests will not be allowed to enter. It gets loud and nasty. I insist that seven is not a group but Shuki tells me that as Yad Va Shem group manager (i.e. the guy who sits at the door) he and he alone shall decide what constitutes a group and what does not. He is correct. I am wrong. Yes, that happens now and then. Eventually I realize my only hope is to admit defeat, admit that I am wrong. No, I did not check the Yad Va Shem website, no I did not read the section on groups and no I am in no position to argue. So I admit my mistake and plead my case asking for mercy. My group is allowed to enter but I am not. I spent some time with Shuki. I get to know him a little. He really is a good guy and it was wrong of me to step on his toes and challenge his authority. This is his job and he takes pride in it, as he should. From that point onward I followed the rules. I contacted Yad Va Shem before hand, I filled out the forms, listing my name, address, phone number, size of group, purpose of visit, countries of origin etc...and faxed it in and waited for the reply. Once I learned to follow the rules everything worked out fine and we always were able to visit on the day we wanted. But there is more to this wonderful story. (at least I think it is wonderful). Now when we visit Yad Va Shem I always make a point of going over to Shuki and saying hello. I introduce him to our group and say "Everyone say 'Hello Shuki'"
He loves it and smiles that wonderful smile of his. First thing that I do when I enter the center is I go downstairs to the cafeteria and say "Coffee and cake for Shuki please, give me something he likes". I bring this to Shuki, he smiles and says, "Ein camocha Moshe", there is no one like you Moshe. We have become friends. And that my friends is the lesson for today. There is no greater victory that turning an adversary into a friend. And sometimes that involves admitting that we are wrong, that we misunderstood something. Sometimes we actually need to say, "Sorry, I was wrong". And that might be difficult for some of us, but just think of the rewards! Do you want to go down with a sinking ship and a sour face rather than admit you are wrong? or do you want to ask a friend for forgiveness, work together and sail safely to shore?